In simple dismissal of Scripture, Pope Francis declared atheists can go to heaven without believing in God. 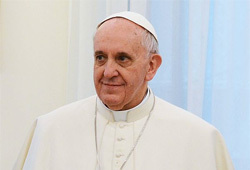 The statement was part of a letter Pope Francis sent to the Eugenio Scalfari, publisher of La Repubblica newspaper. Scalfari is not a Catholic and sent a letter to the Pope asking a series of questions. Pope Francis did throw in one qualifier though, atheists and others would have to listen their conscience. According to reports, Pope Francis is deliberately trying to throw off the strong conservatism that defined Pope Benedict’s previous tenure as Pope. Meanwhile, Francis still insists he is a conservative. In a homily delivered in May, the Pope spoke on these matters in a similar vein. In this sermon, he added a second qualifier for atheists stating Jesus died for all sinners and everyone would be going to heaven provided they did good. The Bible is very clear on the matters of salvation. Yes, Jesus died for all sin and salvation is available to all, but the Bible is equally clear people must believe Jesus died for their sin to receive this salvation. Apparently, the Pope has decided he has more authority than the Bible. It was this opinion shared by previous popes — which resulted in the sale of indulgences — that lead to the formation of the Protestant church. In fact ever since constantine invented that Mithraistic religion, it has ditched the Bible. And has in fact done everything it could, to stop people from gaining access to Scripture. Previous PostWhat really sunk Peter?